Project LINK is seeking sponsors for their annual back to school event. Project LINK is a community based, organization dedicated to promoting education achievement, expanding access to community service providers, and improving the quality of life for low-income individuals via targeted case management programs focusing on children and their families that resides in Hillsborough County, Florida. 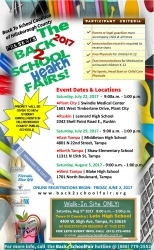 Tampa, FL, June 30, 2017 --(PR.com)-- Project LINK in cooperation or partnership with Integrale Advisors are seeking corporate and individual sponsors for their annual back to school event. "This event has helped so many children in our community over the last several years and we are looking forward to assisting even more young people as they head back to school," stated Keith Knutsson Managing Director of Integrale Advisors. Project LINK is a community based, organization dedicated to promoting education achievement, expanding access to community service providers, and improving the quality of life for low-income individuals via targeted case management programs focusing on children and their families that resides in Hillsborough County, Florida. Our mission is to provide assistance, support, information, and advocacy for low-income children and their families, contributing to them becoming healthy, safe, and educated. Project LINK serves annually over 1000 children and their families via various programs, community events, & workshops with concerted efforts of other community agencies that increasingly value regular school attendance and parental involvement as pivotal contributing factor in school success.